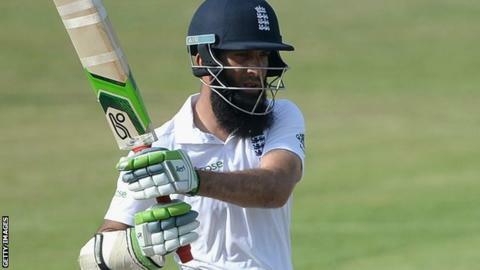 England coach Trevor Bayliss says Moeen Ali has a "good chance" of opening the batting in the first Test against Pakistan on Tuesday. Moeen has managed only 41 runs in three innings during the warm-up matches and was out twice in a day against Pakistan A on Friday. Alex Hales, Moeen's rival to partner Alastair Cook, managed only nine. "Some guys are good under pressure and someone like Moeen has shown he's got what it takes," said Bayliss. England have struggled to find a regular partner for Cook, with Moeen or Hales set to become the seventh man tried at the top of the order since Andrew Strauss retired in 2012. Moeen would be the most likely, allowing England to play a second spinner in Adil Rashid, but it would also represent a huge promotion for the left-hander who batted at number eight during the Ashes this summer. Australian Bayliss, taking charge of England for the first time overseas, added: "I'm not sure it would be a gamble. Yes we would like an out-and-out opener putting his hand up, but there doesn't seem to be a stand-out. "It needs a bit of consistency. It takes a little while to find that bloke, we'll keep trying to find him."